Are you attending NIU on any scholarships? Which one(s)? Recently, I have received the NIU Foundation Impact Scholarship and a Tri-County Community Health Center scholarship. What is your major, and why did you choose your field of study? My major is communicative disorders with a minor in deafness. I chose this major because of my experiences in speech therapy as a child. Growing up, I had a difficult time pronouncing my r-sounds, and, as a result, I spent most of my adolescence unable to say my own name properly. Since therapy, I have made it my goal to become a speech pathologist and help those like I was helped. For me, obtaining a communication disorders degree would give me the opportunity to change lives for the better, and I don’t think there would be anything more meaningful. With a minor in deafness, I hope to bridge a gap between the hearing and the deaf and use my knowledge of sign language to help any deaf person seeking speech therapy. Through volunteering, I discovered a passion for working with people who have disabilities, and I would like to build on this in the future. Speech therapy is needed for many people in our community, and to be able to help just one person’s life would make my entire collegiate career worthwhile. Are you involved in any activities at NIU? What else do you do for fun/hobbies in your spare time? I have been involved in clubs on campus, including the Communication Disorders Student Association and Deaf Pride. Volunteering in research has been one of the most informative experiences I have had at NIU. I also have been a peer tutor in some of my classes, presented autism awareness training to local police, helped establish the National Stuttering Association on campus and was elected vice president of the group. In my free time, I usually can be found watching “The Office” on Netflix or spending time with my friends and family. I enjoy woodworking, herb gardening and playing with my two dogs. What do you like about our campus and community? I grew up around DeKalb, so this area feels like home. I went to football games here as a kid, and I was excited to join the campus as a student. I like how supportive local businesses are to NIU. Most places around campus have Huskie flags in their windows, and some even accept Huskie Bucks. Another great aspect about NIU is the diversity on campus. NIU is an inclusive place that allows students to gain different perspectives. What is something you have experienced at NIU that you will be able to take with you into future endeavors in your field? Learning won’t stop once I get a degree. NIU has helped me see the importance of keeping up with the latest developments in my field and becoming the best clinician I can be. What’s a general piece of advice you’d give to someone starting college? The main piece of advice I would pass on to future NIU students would be to take advantage of everything you can. NIU offers so many great resources and events both on and off campus. Try to meet new people and network with professors. Take time to know and learn from people who have different viewpoints and cultural backgrounds. Balance work and leisure. Don’t spend all your time doing one thing and forget to enjoy the world around you. Do not forget to stay in touch with those who are meaningful to you. In college, you will find that you not only need support from the professors and staff, but that you need support from loved ones just as much. Lastly, take this time to find yourself. College is not just about a means to an end—it is about finding who you are and what you want to be. The person you are now will adapt and change throughout your college career, and that is a good thing. What is up next for you after your time at NIU? Any career aspirations you would like to share? After I graduate, I will be pursuing a master’s degree. I’m interested in working with people who have disabilities and helping them with communication, through speech pathology or a related medical field. What did you used to want to be when you grew up? How about now? In high school, I thought I wanted to go into graphic design. After seeing my mother go through college to get her master’s degree in nursing science and hearing stories of the lives she has touched, I was really inspired to go into a healthcare field. 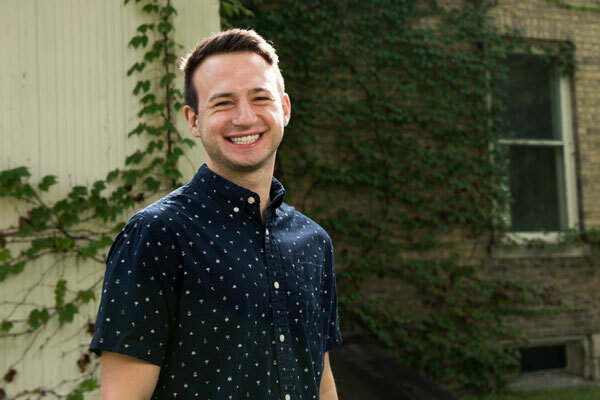 Ryan Scheri, a May 2019 graduate, was a 2018 Lincoln Laureate finalist.